Many photographers and models tend to go to sites like Model Mayhem when looking for new people with which to collaborate, but such sites were built before the days where the majority weren’t browsing from mobile devices. Most sites were slow to make the shift, but I’ve yet to come across any that are 100% mobile friendly (at least on iOS). Now, a new competitor, FStop.fm, enters the field aiming to put models and photographers together through a Tinder-like interface. It’s not a dedicated app and it runs through a mobile browser, so there’s no platform-specific requirements or things to keep updating. On first glance it looks like a pretty good idea. A quick way to scan through models and photographers to find somebody you want to shoot with, much quicker than most of the other options available. So, I decided to sign up and check it out. It wasn’t long before I hit a snag. If you’re based outside of the USA, you’re pretty much stalled signing up through mobile. 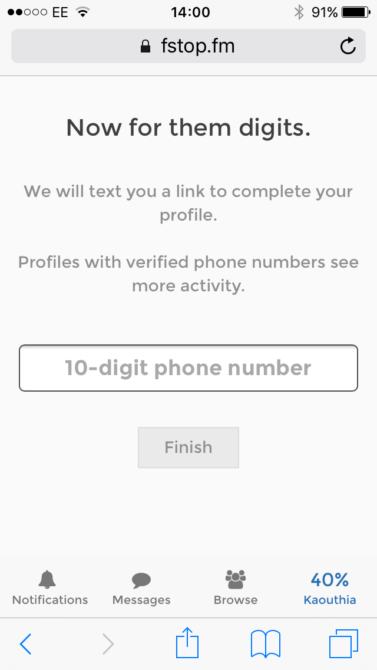 I needed to login through a desktop browser in order to update my settings as part of the signup process requires a 10 digit phone number (UK phone numbers are typically 11 digits). This also means my profile completion is permanently stuck on 80% and I also won’t see “more activity” because I not only because my account isn’t phone verified, but I can’t even put my phone number in. The site also seems to have some issues with distance. Setting my max range to 100 miles presents me with one user. This is pretty much what I expected, being in the UK and it being a US based site still in its early days, but bumping this up to 500 miles started showing me models as far away as from New York to California. Yes, New York and California are WAY more than 500 miles away from me. Anyway, at least it gave me something I could browse through, even if they’re not people I could work with. When models or photographers start scrolling up your screen, you simply swipe left to dismiss them, or swipe right if you might quite like to work with them. If you swipe right on them, and they swipe right on you, then you’re alerted that a match has been found. If you’re in the USA, it looks like it could become a good tool for finding people with which shoot. You see a similar sort of range of people that you do on sites like ModelMayhem. Some look excellent while others… not so much. But that’s to be expected, really. The advantage here, and the only real difference over the existing options, is the speed at which you can sift through them and the focus on mobile use rather than the desktop. Whenever I need to work with a model, I tend to avoid agencies. It’s not that there’s anything wrong with them, but if I have a book filled with stunningly beautiful people who make a living based on being stunningly beautiful, I’d never get any clients. If I shot more commercial or fashion, it might be different, but I don’t. Most of my portrait clients are private individuals. They look like regular people, and they want to see regular people looking amazing to give them some confidence I can make them look amazing in front of the camera, too. So, sites like ModelMayhem are useful to me. Hopefully, FStop.fm will become more usable for those outside of the USA once it becomes a bit more established, they iron out some of the bugs, and it starts to pick up more of an international userbase. Are you on FStop.fm? Have you arranged a shoot through it yet? Where do you think it has the advantage or lacks something against the competition? Let us know what you think in the comments.
. real-life truths of the business, the Internet, and its overlapping Venn systems. And there lies a potential problem. People using it like Tinder and contacting others for hook ups rather than arranging shoots. I signed up. We will see. I was gonna tag Adnan Faraz too? Your click bait title is more than a little sad.